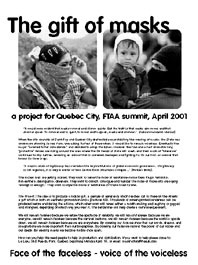 In April 2001, the Mask Factory was set up as a project in the run up to the FTAA actions in Quebec City . A few of us arrived in Montreal a month in advance of the FTAA summit, and started working with local activist groups and art students at Concordia University. The city had made the wearing of face masks illegal, so we decided we would mass produce gifts of masks for the expected 10,000 protesters. Raising the issues of carnival, anonymity and health (due to 5,000 tear gas canisters being used). By working with local groups in Montreal and Quebec we managed to build a screenprinting area, where we mass produced 4,000 masks in yellow, orange and red. Parcelled them up and gave them away on the streets. Below are some of the texts from the call out, and the mask itself. Click here to see the production, distribution of the masks and the related exhibition. "We will remain faceless because we refuse the spectacle of celebrity, because we are everyone, because the carnival beckons, because the world is upside down, because we are everywhere. By wearing masks we show that who we are is not as important as what we want, and what we want is everything for everyone." "Permaneceremos sin rostro porque rechazamos el espect‡culo de la celebridad, porque somos todo el mundo, porque el caranaval nos espera, porque el mundo est‡ del reves, porque estamos en todas partes. Llevando las m‡scaras mostramos que no es tan importante quienes somos sino lo que queremos, y queremos todo para tod@s"
"It would seem evident that masks conceal and silence quiets. But the truth is that masks also reveal and that silences speak. To conceal and to quiet, to reveal and to speak, masks and silences." When the city councils of Saint-Foy and Quebec City drafted bylaws prohibiting the wearing of masks, the State was once more showing its real face, unmasking its fear of those whom it would like to remain voiceless. Eventually the mayor "listened to her conscience," and decided to scrap the bylaw. However, the four-and-a-half kilometre long "protective" fences are rising around the area where the 34 heads of state will meet, and their mask of "tolerance" continues to slip further, revealing an animal that is cornered, besieged and fighting for its survival, an animal that knows its time is up. "A classic crisis of legitimacy has overtaken the key institutions of global economic governance. If legitimacy is not regained, it is only a matter of time before those structures collapse..."
The money men are getting scared. They want to name the faces of resistance--name them thugs, terrorists, flat-earthers, delinquents, dreamers. They want to collect, catalogue and number the faces of those who are saying "enough is enough." They want to wipe the smile of resistance off those faces forever. The Project: The idea is to produce a radical gift, a gesture of generosity which reaches out to those on the streets; a gift which is both an aesthetic provocation and a practical tool. Thousands of screen-printed bandannas will be produced before and during the actions, which when worn will reveal either a mouth smiling and laughing or gagged and strangled, depending on which way you wear it. The bandannas will help create a carnivalesque event. We will remain faceless because we refuse the spectacle of celebrity, we will remain faceless because we are everyone, we will remain faceless because the carnival beckons, we will remain faceless because the world is upside down, we will remain faceless because we are everywhere. By covering our face we show that our words, dreams, and imaginations are more important than our biographies. By covering our faces we recover the power of our voices and our deeds. By wearing masks we become visible once again. Quand les conseils municipaux de Saint-Foy et de Quebec ont propose d'interdire le port de masques dans l'espace public, c'est l'Etat qui a revele son vrai visage, en demasquant sa peur de ceux qu'il voudrait faire taire. Le maire de Saint-Foy a fini par "ecouter sa conscience" et la loi a ete ecartee. Mais un mur "de securite", long de quatre kilometres et demi, s'eleve toujours autour du quartier ou les 34 chefs d'Etat vont se rencontrer, et leurs masques de "tolerance" tombent toujours plus bas, en revelant la bete sauvage et apeuree, qui se bat pour survivre et sent sa fin qui s'approche. Les hommes d'argent ont peur. Ils veulent donner des noms biens precis aux visages de la resistance Ð ils les nomment hooligans, terroristes, delinquants, utopistes. Ils veulent chasser le sourire de la resistance. Le projet : L'idee, c'est de produire un don d'une gratuite radicale, un geste genereux qui puisse toucher ceux qui vont manifester dans la rue Ð un don qui est un outil pratique et une provocation esthetique. Des milliers de foulards serigraphies seront produits avant et durant les actions, qui montreront, soit un visage souriant et riant, soit une bouche etouffee et etranglee, selon le c™te que l'on choisit de porter. Les foulards se rajouteront a l'ambiance de carneval generalise. Nous serons sans visage car nous refusons le spectacle mediatique, nous serons sans visage car nous sommes tout le monde, nous serons sans visage car le carneval nous attend, nous serons sans visage car le monde est a l'envers, nous serons sans visage car nous sommes partout. Se cacher le visage, c'est montrer que nos paroles, nos reves et notre imaginaire comptent plus que notre biographie. Se cacher le visage, c'est retrouver la force de nos voix et nos actes. En portant des masques, on redevient visibles. Comment contribuer: Nous avons besoin d'aide pour la production et la diffusion. Click for the production / distribution and related exhibition.